Styling and designing a blog is hard work. Especially for a newbie blogger. Unless you're actually a web designer or go ahead and get your entire blog template professionally designed and installed then it's all going to be a bit of a learning experience. With a lot of discovering new things and throwing them in there. 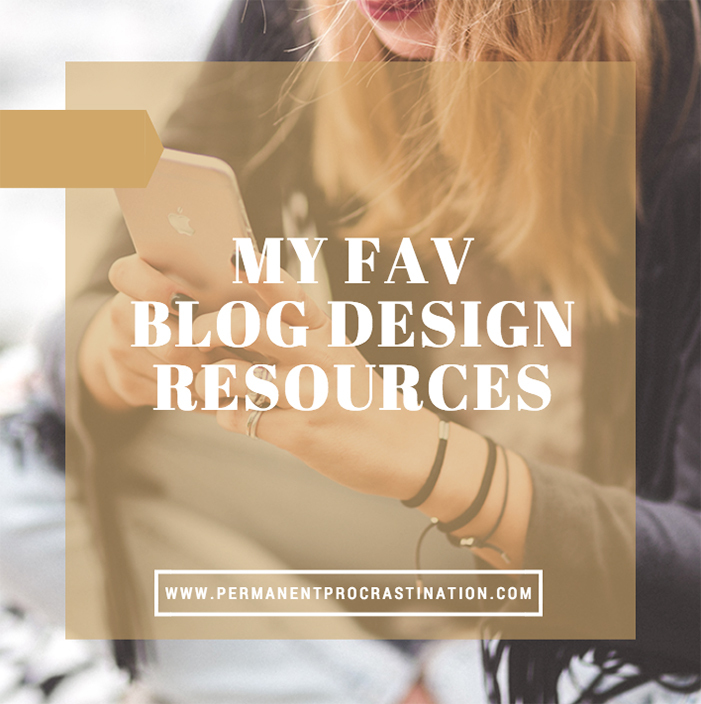 I've rounded up some of my favourite resources that I use when it comes to design and overall making my blog look pretty and functional. Even with all these, my overall favourite design resource is really just gaining inspiration from every blog I visit. I love using these websites to add a little something extra to my blog, or to update my existing template. They often have already answered questions I have when it comes to design and coding issues. Which is super helpful. XOMISSE - Lots of coding and design tutorials for both Wordpress and Blogger. Elaine covers a whole range of topics relating to blogs. I definitely use this website as a reference a lot. I Can Build a Blog - I am such a Big fan of Dana Fox, she writes soo many good guides and tutorials and everything bloggy. I Can Build a Blog is her side blog completely devoted to helping you become blog and design savvy. The Wonder Forest - This is Dana's main blog, she has an entire tag called Blog Help, which is fantastic. You can find some different things here than she has on her side blog. Clover & Dot - Kate may only be young but she's already incredibly code and design savvy. She has quite a few different tutes and guides that should be super helpful. Just mouseover the "Design" button at the top of her blog. There are a lot of places to get templates online, these are just a few and most of the ones I've listed are paid templates. There's nothing wrong with having a free template! I have seen quite a few good blogs that are running the default blogger "Simple Template" with pretty features added in. Pipdig - The designer of my current blog template. Phil was super helpful, even when I e-mailed him months later with a dumb question, thanks Phil. I added a few things to the template myself after installing, that would have come with an extra price tag if I'd wanted him to install them. Envye - Dana Fox's very own template shop, she's a very talented lady. You can find templates for both Blogger & Wordpress here, as well as some graphics, photoshop actions and fonts for sale. Mango Blogs - I kind of wish I would have found these earlier, because these blogger templates are both amazing and very affordable. If you're just starting out, I highly recommend this etsy store. Maira Gall - Another etsy store, and creator of my second blog template. Maira was super helpful with any queries I had about my template. She has beautiful templates for Blogger with Wordpress ones on the way! Clover & Dot Templates - These templates are super cute with lots of personality. With the majority of them mobile ready, you're sure to find one in your price range. Theme Xpose - A variety of free templates with quite a range of different styles. Good for bloggers just starting out who want a template but haven't committed yet. I bounce back and forth from using stock photos to using my own. I do like to take my own photos the most obviously, but sometimes working for most of the day doesn't leave any good light left to take photos. That's where stock photos come in. These are all free to use, with no need to leave a source. Unsplash - Beautiful large images, often of landscapes and cities. New photos added weekly. Website has a reasonable search system also. Gratisography - Usually crazy bright stock photos, often of people and random inanimate objects. Free to use with new pictures added weekly. Start Up Stock - Lots of desks, computers, and people working. Kaboom Pics - A random variety of photos with a good search system. I use this website quite a bit now that I've found it. Splitshire - Beautiful photos. Definitely a stock website I need to utilise more often. Death to the Stock Photo - Has a free subscription services where a stock photo pack is sent out each month. There's a premium service where you can access their entire stock library, which I haven't done but I feel it would be worth it. Snapwire Snaps - Similar to Unsplash. New photos added weekly. Minimography - Gorgeous minimalistic stock photos. They're only new so not too many photos, but still beautiful. Canva's Design School - There is a huge selection of free stock photos here! Definitely worth checking out. Got a favourite resource that fits under one of these headings? Link it to me in the comments, if I like what I see I'll add it to the list, and i'll link back to you as suggestion credit! Rad! Wonder Forest is one of my favorites! Thanks for the list. The coding and design part is especially useful, since I always tend to mess up somewhere in code. Even though my boyfriend is a computer science major, I've yet to let him read my blog because of my own insecurities haha, so I can't rely on him to help me out! Or more like I can, but I don't want to lol. I regularly check out and utilise XOMISSE as well, her tips and tutes are so easy to follow and so great. Much agree. Thanks for sharing your resources, I can't wait to check them out! Great post and selection dear! I've heard of Pipdig! That's who I would work with next! I used 17th Avenue, but would'nt recommend them. Nice in the beginning, but elusive and fled at the end. Never fulfilled things I asked for in the initial assessment. this is so helpful! it inspires me to really invest time in blogging <3 thanks for the great post! XOMISSE has saved me many a time, that's for sure!! ooh, this is exactly what I needed! Thanks for sharing these girl! Thanks for sharing your blogging tips at the #SundaysDownUnder linky party! I’ve pinned your post and tweeted. This is a great list of resources!